The Power Try trial of lighting the crossbar is a good idea as shown recently on FTA. However they need to change the lighting assembly to be fitted below the crossbar as it is restricting the area above the crossbar to score points. I've sent a message to Western Force hopefully they refit them before the game. Last edited by JPR; 03-05-18 at 10:11. It came up on channel 7 Western Force had a good report in the sport section,showing a row of LED type lights fitted to the top of a crossbar. Last edited by JPR; 03-05-18 at 10:51. I still wonder why wouldn't a smart team give up the penalty just to kill momentum. Presumably, this will keep the action happening. Thats pretty much been the common theme with most 9 point try attempts to date. c) give everyone at the ground access to the refs mike by free-to-air radio. And of those, the last would make the biggest difference to the involvement of the crowd with the game. Hands down...you want to differentiate from SR, that's it. With one lucky winner able to talk to the ref - that would be a winner. 2. Rolling Subs – teams may make up to 12 player substitutions during the game, as opposed to the current 8 substitutions. That doesn't look so much like rolling subs as an extension of the laws that applied specifically to the front row for safety. 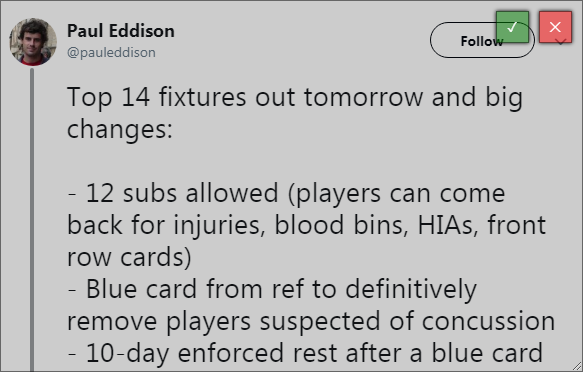 In fact, given that the 8 man bench contained 3 front rowers, it is technically possible under the current laws to have 11 subs anyway (clear the bench = 8, then replace each of the bench front rowers with a starting front rower for injury) actually, even more with a couple of blood bins, HIAs where the player is allowed back onto the field etc. Are we sure that 12 is not a restriction on some shenanigans that have been going on in Top 14? Don't forget it was the French who first trialled 8 man benches with a specialist front row as subs to prevent uncontested scrums. Not a fan of rolling subs it is used in the AIL in Ireland and it becomes like League. I'll have to take your word for it, not really a student of French rugby history, but the hypothetical I was discussing makes a rolling substitution of 12 seem not much difference to the status quo. I wonder what's holding it up? 12 subs is not even close to the status quo. Front row subs are rarely replaced these days. All times are GMT +8. The time now is 17:03.